Below is Jeremy Irons’ reaction to being nominated for a Golden Globe for his work in The Borgias. Congratulations to Jeremy from all your fans at Jeremy Irons Online! 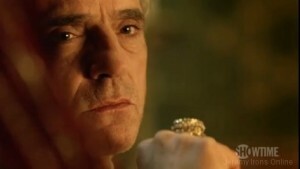 Veteran thespian and two-time Globe winner Jeremy Irons picked up his sixth career nomination for “The Borgias,” which Showtime renewed for a second season earlier this year.